Something strange is afoot behind the swirling mists of the seaside town of Kingsport. Just inside the haunted harbor, small cracks in the walls between worlds have begun to form. If left unchecked, these cracks may deepen, eventually crumbling into a swirling rift – an open gateway through which the evils of beyond may spill forth, bringing terror and doom down upon Arkham and quickening the arrival of the Ancient One. The Kingsport Horror expansion for the Arkham Horror board game adds another board section that represents the town of Kingsport, with new encounter locations and two new Other World locations for the investigators to explore. Aiding in that exploration are 8 new investigators and quite a few new common items, unique items, spells and allies. A few intriguing and especially nasty monsters have been added into the mix, as well as 4 new and incredibly ghastly Ancient Ones. The game also includes and introduces Epic Battle cards – a new way to add some thematic spice to your final showdown against the Ancient Ones. 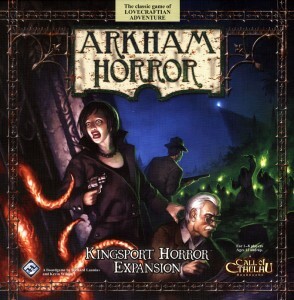 Overall, the Kingsport board is a beautiful addition to the Arkham Horror base game. There are four new groups of encounter locations, including the centerpiece of the town – the Kingsport Head. The Head consists of three locations: the Causeway, Wireless Station, and the wonderfully mysterious Strange High House in the Mist. The Head is notoriously difficult to traverse, and this is represented by a new location function called Hard Going. Basically, whenever an investigator enters the Causeway or the Wireless Station, they must end their movement. This new function turns a trip to the Strange High House in the Mist into an arduous five-turn trek. Why would any sane investigator go on such a journey? Well, sanity is subjective in Arkham Horror, but upon reaching the Strange High House, an investigator can spend gate trophies or monster toughness to acquire the Changed card. This basically adds +1 to maximum Sanity and Stamina. The Changed card can also be exhausted instead of using a clue token. Very handy. An investigator will also receive The Great Seal, which allows any gate to be sealed permanently without risk of gate bursts or other effects. Clearly, these grant an investigator some fantastic bonuses, but are they worth the time-consuming and often-difficult voyage? Thematically, yes; technically, no. Thematically, the rough journey makes you feel as though your investigator is up against the mystery that IS Arkham Horror, and it almost becomes a test of wills. It also adds to the story and drama that is an essential element in the game. Technically, however, it’s very difficult to fit a trip up to The Strange High House into a game. As mentioned, most trips will take at least 5 turns for a payoff, and you are only able to get the Changed card if you are stocked with gate trophies and/or monster trophies. This usually only occurs when the game has gone on for quite some time and the Ancient One may be close to awakening. By that time, most investigators are scurrying about trying to close or seal that last gate before doomsday. On one hand, though, a trip up the treacherous Head would be worth an investigator’s time if the awakening was inevitable and the investigator had time to travel up and get stocked for the final battle. The Head isn’t the only intriguing location in Kingsport. The town is stocked with a hospital, a tavern, and a curiosity shop, as well. The hospital is a handy location – not as powerful as St. Mary’s back in Arkham, but it allows investigators who have had a rough time in Kingsport the chance to gain stamina AND sanity in one spot. The Rope and Anchor Tavern, however, isn’t quite as useful. An investigator can spend a turn here, pay $1, and search the common item deck for a food or whiskey card. The food and whiskey cards can be beneficial one-use cards, but when compared to spending a turn having an encounter somewhere else that may have a big payoff, the time here clearly isn’t worth it. Neal’s Curiosity Shop is very useful, though. Here, an investigator is able to sell off some of those less-useful items that have been collecting dust. The final “special” location in Kingsport is the North Point Lighthouse in Harborside. Here, an investigator can spend the requisite amount of gate and/or monster trophies to take the Captain of the White Ship card (and, subsequently, the White Ship herself). These two cards are pretty useful. The captain prevents an investigator from being delayed while in an Other World, but both cards are discarded if the investigator becomes lost in time and space. The White Ship allows an investigator to move to the first world of an Other World from anywhere in Arkham or the Other Worlds, during movement phase, even if no open gates currently lead to that Other World. This card, in itself, is worth the price of the gate and/or monster trophies. The tactical flexibility it affords an investigator can often be invaluable during a game. Compared to the Strange High House, the North Point Lighthouse also has the benefit of not taking five turns for a payoff, giving the lighthouse the edge in this expansion. One important thing to note about Kingsport and its locations is that all locations are stable. No gates will open under investigators, drawing them into an Other World, nor will gates open and spit forth monsters. In a sense, it adds to the special charm of the seaside town, but it can also be a hindrance to the investigators, as anyone in Kingsport is unable to help in closing or sealing gates to prevent the Ancient One from awakening. This can be a bit frustrating, at times, but it mostly adds to the difficulty level of the game, which makes for a much tighter and more tense finale, in most cases. The main new mechanic that Kingsport introduces, and the reason that investigators are drawn to the town in the first place, is the appearance of rifts. Rifts are tears in the fabric of space and time that can open and roam around Arkham, spitting out monsters and wreaking general havoc. 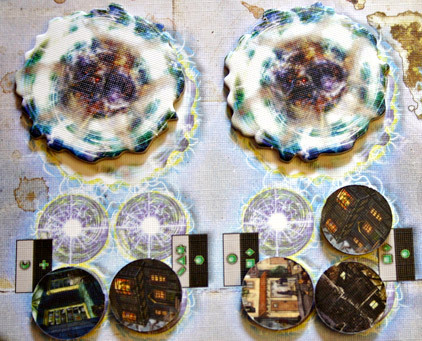 Rifts develop gradually, as special rift tokens accumulate on three different rift tracks on the side of the board. Each time a mythos card is drawn, a rift token is placed on the track that corresponds with the monster movement symbols on the mythos card. The rift tokens are drawn randomly, and contain the picture of a specific location in Kingsport. Investigators can prevent rifts from fully forming by removing rift tokens on the rift track. A rift token is removed every time an investigator has an encounter at any location that is represented by the image on the back of a rift token. When all the spots in a particular rift track are filled with tokens, a rift is formed and opens in the location indicated by the gate spot location on the last mythos card. On the back of each rift is one of the dimensional symbols that controls monster movement. Each time that symbol appears during monster movement in the mythos phase, the rift moves as well and spawns a new monster in the location where it moved. In addition, a doom token is added to the doom track. Needless to say, open rifts aren’t a welcome site in Arkham! Some players have expressed dissatisfaction with the rift system and with Kingsport, in general, but the threat of open rifts really adds an interesting and fun twist. One past game with my investigators, in particular, taught the value of keeping rift tokens in check, as a rift tore open and zig-zagged its way through Arkham on almost every turn. The doom track gained four new tokens before we were able to close the rift, and it wasn’t long before Azathoth awakened and the world ended with a burp. There are 8 new investigators in Kingsport, ready to battle against ancient evil. Some of the newest additions seem like a weak addition, but there are a few interesting and very useful characters in the mix. Luke Robinson, a virtual native of the Dreamlands, fits the Lovecraftian theme well with his ability to traverse Other Worlds fairly easily. The street urchin, Wendy Adams, is uncannily sneaky and could come in handy when there are lots of monsters filling the streets. She also begins the game with an Elder Sign which, combined with her stealth skills, can put her into a position to quickly dispose of a pesky gate in the first few turns. Two other interesting characters are Rex Murphy and Lily Chen. Rex is a very unlucky journalist – he begins the game cursed, and he can’t rid himself of that curse during the upkeep phase. However, every time finds a clue token he gains an additional clue, so his investigative powers are unmatched. 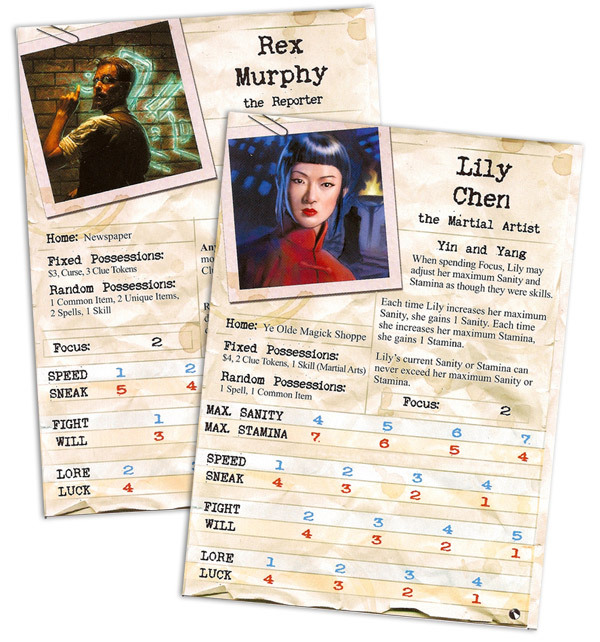 Lily Chen, the martial artist, is a veritable combat god – an almost unheard-of occurrence in the Lovecraft-themed games. With her ability to adjust her maximum Stamina and Sanity as if they were set as a skill slider enables her to tackle almost any situation. For the most part, the mix of monsters that get added to the cup from Kingsport is pretty good. A couple of standouts are the Leng Spiders (nice to see those mysterious creatures popping up from out of the Dreamlands) and the deadly Shan that can devour investigators on the spot. Yeah, that’s right – DEVOUR. Let me tell you there have been a few nerve-wracking moments when one of our investigators has come face to face with those critters. The Kingsport monsters also add two more Mask monsters, which make taking Nyarlathotep as the Ancient One more interesting. Kingsport expands on the types of monsters, as well. In this expansion, aquatic monsters are introduced, which can travel from one location that is marked as aquatic to another aquatic location closer to an investigator. They’re sort of like limited flying monsters without a sky, and are denoted by an orange border. 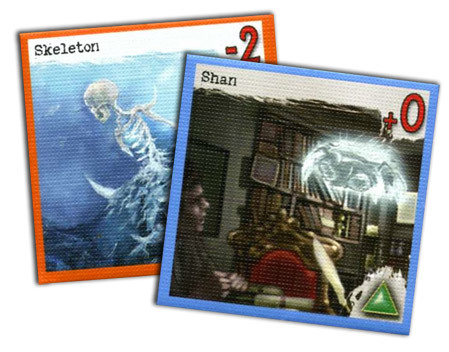 As a result of the new aquatic baddies, the game comes with two aquatic tokens to place on the River Docks and the Unvisited Isle back in Arkham. This is a nifty concept, but the game only introduces four aquatic monsters into the mix. With so many monsters in the cup and so few aquatic monsters and locations, they don’t really affect the game very much. The aquatic theme has a much larger impact with the Innsmouth Horror expansion, where Deep Ones run amok. Besides the rifts, another great component that’s introduced in this expansion is the Epic Battle card deck. These cards are only brought out when the Ancient One awakens. Each turn before upkeep, a new card is drawn, and it details bonuses or detriments that may occur during the final battle that turn. The Epic Battle cards start out fairly benign, but they grow in severity and maliciousness as the battle wears on. There are also instances when a Sinister Plot card should be drawn. These are a set of cards – 3 each for every Ancient One – that brings some specific flavor into a battle. These can really zero in on an Ancient One’s particular nastiness, and add even more thematic flair to the showdown. All in all, the Epic Battle cards seem to be a welcome addition to the game. 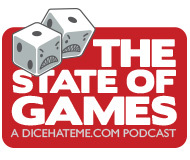 The weakest part to us has always been the constant dice rolling in the final battles, which always lacked a lot of the storytelling elements of the main game. The Epic Battle cards continue the story until the very grisly or heroic end. Overall, Kingsport is definitely worth the money, especially if you are looking to add some extra spice or difficulty to the base game. Although there are no unstable locations in Kingsport, there is still more than enough to keep investigators occupied with unique encounters and the ever-increasing threat of rifts. The additional mythos cards also add a lot of extra twists to the game – one moves all the monsters on the board at the same time! Another finds the first player Lost in the Mist, and sends the investigator straight to The Strange High House in the Mist. The extra location encounter cards for Arkham are great additions, as well, and ensure that there is a lot of variety and replay value across several games. And, of course, the new investigators – for the most part – are intriguing and useful. 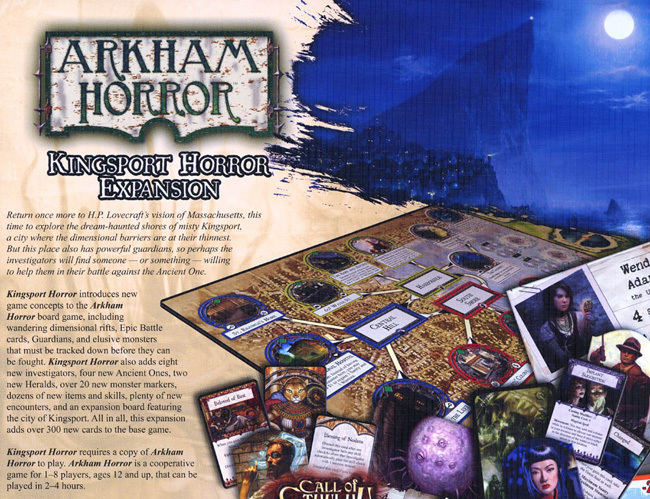 Kingsport will offer even more for those players who truly enjoy the thematics behind Arkham Horror. The story of the sleepy seaside town plagued constantly by heavy fog and mists in which any manner of evil could lurk is horror at its best. I will be paying a visit to Kingsport many more times – as long as my sanity holds out, that is. Did you know you can buy a very Lovecraftian Miska-Tonic shirt in the Dice Hate Me store? Lo, it be true! Good review, my sanity is frayed just from reading it. I’ve added Arkham Horror to my gaming “want list”, along with this expansion; my kids are finally old enough to become acquainted with the Ancient Ones. Thanks for reading, Jack! Arkham Horror never disappoints; it is definitely in my top ten. Give yourself a Halloween present!